Like Pearl and Gwinnett, Cobb thinks it can come out ahead. The county expects the new stadium to generate about $24 million per year, $3 million more than the annual debt service requirement, according to Moody’s. The plot where the stadium and surrounding 57-acre mixed-use development will go, Plant says, currently generates $305,000 a year in property tax. In 2018, the Braves’ first full year in the stadium, he expects the project to generate $28 million in property and sales taxes. As with Pearl and Gwinnett, Cobb’s taxpayers will be on the hook to make up the difference if revenue falls short of estimates. According to bond documents, there’s no cap on how much the county may have to spend. Every Cobb commissioner except Lisa Cupid needs to go. Epic fail on their part. "As with Pearl and Gwinnett, Cobb’s taxpayers will be on the hook to make up the difference if revenue falls short of estimates. According to bond documents, there’s no cap on how much the county may have to spend." 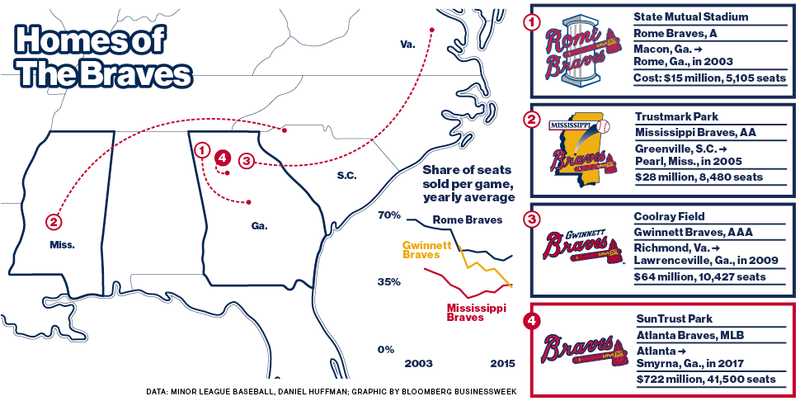 Very interesting history of stadiums from the Braves over the past 10 years, it's clearly a history of bad, backroom deals to squeeze governments that don't know what they are getting into. Lisa Cupid was clearly the smart one in this game. At least city of Atlanta, doesn't have to deal with this debacle. Glad I live in Fulton. Maybe this will be a good thing though in the long run, as perhaps this error will force Cobb into joining MARTA sooner than expected. I for one would love to see that. Get a MARTA station or stations in areas that I actually care about. I would end up going downtown more, I think. One of the reasons I don't right now is the fact that I *hate* driving around looking for parking. I'd love to see MARTA there too. But my hopes are not high for it happening in the near future. If the traffic challenges arise that many seem to think will arise after the Braves' new stadium opens in the Cumberland area, it could potentially make the implementation of high-capacity transit a much more attractive option than it currently is with Cobb County's conservative transit-averse electorate. But even if the new Braves' stadium worsens traffic to the extent that many are predicting it will be, the chances that Cobb's conservative transit-averse electorate will suddenly feel compelled to embrace MARTA expansion into the county will likely still be slim....Particularly if the new Braves' stadium happens to not pan out for the county financially as has been the case with the Braves' other stadium deals at the minor-league level. Cobb's existing conservative electorate will most likely not want to follow up a questionable stadium deal by voting to raise taxes to fund a transit system that most of the current electorate strongly dislikes in the Fulton/DeKalb/Clayton-dominated MARTA. If Cobb County ever feels compelled to embrace high-capacity transit connections to the rest of the Atlanta metro region, any effort to extend high-capacity regional transit into the county would likely have to be led by Georgia state government or some kind of coalition of Northside areas that was separate from MARTA. Cobb's electorate just does not yet quite seem to be diverse enough to vote to raise taxes to expand MARTA into the county, even if the Braves stadium worsens traffic as many are predicting. I disagree. What is the assumption you make based on? A vote taken 40 years ago? Maybe there is more recent data, but I know I (as a 12-year Cobb resident) would certainly vote for MARTA in the county if the proposal made sense. The last T-SPLOST proposal was rather silly, IMO. As an increasingly urban county of more than 740,000 residents with an increasingly limited road network, there is a definite need for high-capacity transit service in a county as heavily-populated as Cobb. As Cobb's electorate continues to grow, expand and diversify with moderate, progressive and minority voters from the ranks of the newcomers that continue to move into the county, Cobb's political climate will likely one day be amenable to the prospect of high-capacity transit (MARTA or otherwise) being expanded into the county from Atlanta and Fulton County. At this point in time, it will probably be about 10 years or so (maybe roughly somewhere between 5-15 years) before a MARTA expansion referendum could be successful in Cobb County. A traffic disaster brought about by the opening of the new Braves' stadium could potentially move up the timetable for high-capacity transit being expanded into the county, though probably not by way of an agency like MARTA. Another thing that should probably be kept in mind in this discussion is how the performance of the team may affect the financials of this stadium deal. If the Braves come out next on fire and compete throughout the season for the NL East division title or a postseason berth during their first season in the new stadium, the financials of this stadium deal will likely work out much better for all parties involves (particularly Cobb County government) than if the Braves struggle next year. Much of how this stadium deal works out financially for Cobb County government will likely depend on how the Braves perform on the field. After this year, the next Cobb Commission elections will not be until 2020, so Cobb County government may likely get a little bit of time for this deal to work out for them, particularly if Cobb Commission Chairman Tim Lee and the commissioners who voted for the stadium deal are re-elected in 2016.